With the new year approaching, there is much to celebrate! While New Years Eve can be an awesome celebration, there are a few precautions you should take to keep the night safe and fun. While it should be obvious, it has to be said- Do NOT drink and drive. Besides the fact that it’s incredibly risky for your safety and others, there will a ton of cops out patrolling and looking for drunk drivers. Instead of scrambling for a safe ride home last minute, plan ahead your transportation. If you’re going to a bar, look in advance what your transportation options are. Cabs, Ubers, or Lyft are typically available in larger cities. 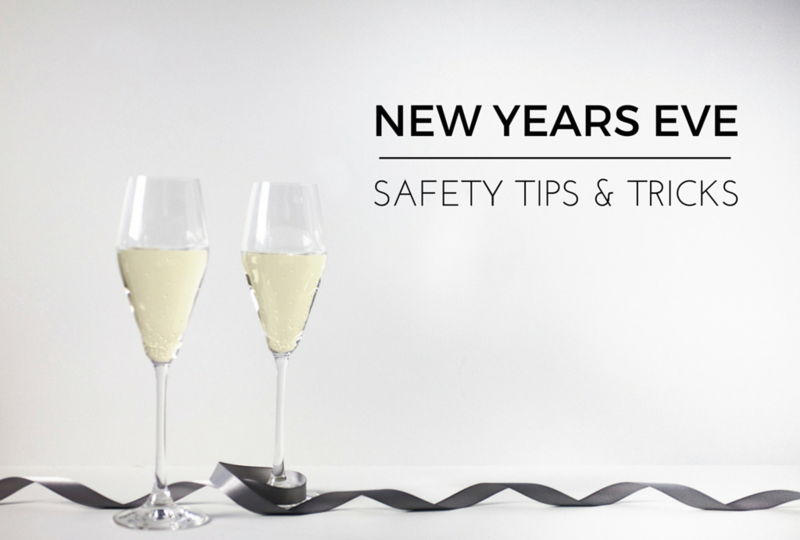 While they can be more expensive on NYE, it’s worth the price of getting home safe and sound. If you are driving to a friends house and plan to drink any alcohol at all, stay over night or have a designated driver you can trust to drive you back- this is especially important if you are in an area where there is limited access to taxis and ride sharing apps. Another options is hiring a driver for the night. With group options or splitting the cost among friends, it may be more affordable than you think. You’ve probably heard the phase “strength in numbers.” Remember this on NYE. Don’t find yourself alone on leave any one behind. While it’s safe to assume much of the population will be drinking on New Years Eve, it’s best to stick together with your friends. Don’t let friends wonder off alone either. 3. Enjoy a Delicious Meal! Who doesn’t want an excise to eat a nice delicious big meal?? New Years Eve is the perfect night for that. Avoid starting the new year with a massive hangover by eating a healthy & hefty meal before you go out. A substantial, healthy meal will help absorb some of the alcohol and even better, may keep you from snacking on junky appetizers and sweets later on the night which can be prevalent around NYE parties. Even if you can’t do a fancy meal, be sure to have something in your stomach before you go out. Your body will thank you for that January 1st. While there’s nothing wrong with a celebratory drink on NYE- that is if you’re 21- but it’s important to be smart about it. Know your limits and only drink what you can handle. To prevent your head from feeling completely foggy the next morning, a good rule of thumb is one glass of water per every serving of alcohol. If you or one of your friends over drinks and may have alcohol poisoning, don’t hesitate to call 9-1-1 immediately. Communication with your friends is key on big party nights like NYE which also tend to be long nights out. Make sure your cell phone is fully charged before you head out the door. Consider bringing a portable charger if you have one, or at least a wall charger for emergencies. That way, if you do get separated from your friends, you’ll be able to contact them. Have a meeting spot or end of the night plan- that way if you can’t get in touch with each other or do get separated, at least you’ll have a time and place to meet up. Also, always make sure you and your friends know each others’ whereabouts- even if its just a quick trip to that bathroom. Have a wonderful New Years Eve! Don’t put too much pressure on the night and just enjoy the night with you friends or family. Celebrate your accomplishments of 2015, and look forward to all that is to come in 2016!